"...there were a lot of people involved in this affair [the Haganah/Sonneborn arms theft and smuggling network] and the Department of Justice knew it. He further pointed out that there were 70 people involved on the West Coast. Crum went on to state that it was necessary to have a group working rather than Feinberg and that it would be necessary to have a war chest. This group should include Feinberg who would act as chairman and be responsible for the disbursement of funds." Abraham Feinberg (1908-1998) is best known lobbying for the state of Israel and organizing Harry S Truman's "whistle-stop" fundraising tour that saved his 1948 presidential campaign from certain ruin. Feinberg's obituary hints at a role trafficking arms to Jewish fighters in Palestine. As founder of Americans for Haganah and Foundry Associates, Inc., Feinberg was deeply involved in the Haganah arms smuggling network in the United States. More recently, authors such as Anver Cohen and Michael Karpin document in the book "Israel and the Bomb" and "The Bomb in the Basement" Feinberg's role in undermining US nuclear nonproliferation policy. On October 31, 1958 Israeli Prime Minister David Ben-Gurion noted in his diary a conversation "he had with Abraham Feinberg, a wealthy Jewish businessman and major Democratic fund-raiser" to raise funds for Israel's nuclear weapons program among "benedictors" in the United States. A few years later, President John F. Kennedy fought for biannual international inspections of Dimona and verifiable Israeli assurances that it was not a nuclear weapons production facility. In 1960 Feinberg funded the American Israel Public Affairs Committee (AIPAC) as it mounted US disinformation campaigns about Israel's nuclear weapons program. JFK's assassination in 1963 marked the gradual end of inspections and the US nonproliferation drive toward Israel. Feinberg's file reveals the FBI's ongoing law enforcement interest in Feinberg's activities as an espionage (offense code 54) threat from the time he was investigated for dodging the WWII draft, arms trafficking through the front company Foundry Associates, and on into the early 1960's over frequent meetings with Israeli intelligence officers. In 1952 Feinberg, acting as president of the lobbying newsletter Israel Speaks, (a successor publication to Haganah Speaks) was ordered to begin registering as an Israeli foreign agent. Feinberg and his close associate David Wahl considered selling it to the Jerusalem Post, but later closed it down rather than register. Wahl, among other Feinberg associates, was a longtime undercover Soviet agent (beginning in the 1930's, code named "Pink") in the United States. FBI surveillance coverage of Feinberg stops during a period reporter Seymour Hersh characterizes as Feinberg's moment of greatest influence over US policy: the Lyndon B. Johnson administration. In the late 1970s Robert J. Lipschutz obtained the FBI's Feinberg file under the authority of the Carter administration. 04/17/1952 441 KB Memo to the FBI Director from Daniel Milton Ladd, Assistant Director. (Copies Destroyed on May 23, 1963). "To advise you that there are attached hereto two memoranda concerning Abraham Feinberg, one a complete memoranda for your information setting forth all information in the Bureau's files concerning Feinberg, the other a blind memorandum which you may wish to disseminate." "Prior to the creation of the Republic of Israel in 1948, Feinberg was active in various Jewish organizations in the United States whose purpose was directed toward establishing an Israeli Republic. In this connection he was President of Americans for Haganah, Inc., 250 West 57th Street, New York City, which published "Haganah Speaks" a bi-monthly publication. After the creation of the State of Israel in 1948, Feinberg was in frequent contact with officials of the Israeli Government in the United States, from the Ambassador on down to minor officials. He was in personal contact with Chaim Weizmann, first President of Israel, when Weizmann visited the United States in April 1949 and on other occasions. Feinberg has been in personal contact with Ben-Gurion, Prime Minister of Israel, when he visited the United States. These contacts with Israeli officials continue up to the present time and are directed primarily toward furthering the best interests of Israel. Feinberg is known to have had personal interviews with President Truman on various occasions from January 26, 1949 to date concerning Israeli matters. Drew Pearson alleged in his column on April 5, 1949 that Feinberg had pledged $100,000 to reelect President Truman. Feinberg was chairman of the Democratic Party committee in New York City. In November, 1948, an indictment was returned in Miami, Florida charging nine individuals with conspiracy to violate the Neutrality Act, based on evidence that attempts were made to transport airplanes illegally from the United States to Israel when the latter country was at war with the Arab nations. Among those indicted were Adolf Schwimmer and Irving Schindler. An anonymous source of known reliability advised that the Israeli Government was fearful that prosecution of Schwimmer and Schindler would result in publicity unfavorable to Israel and that the Israeli government instructed Eliahu Elath, Israel Ambassador to the United States, on April 1, 1949 to "squash it forever." One of the several courses of action recommended by the Israeli Government was to have Abe (believed to be Abraham Feinberg) take it up with his friends. Informants advised that Feinberg was probably in touch with Bob Hannegan and other high Government officials trying to get them to exert political pressure on Tom Clark, Attorney General, in connection with these cases. Feinberg has been in contact with Colonel Ephraim Ben-Arazi, former Israeli Military Attach� to the United States; Theodore H. Kollek, Israeli Minister in Washington; Reuben Shiloah [founder of Mossad], personal advisor to the Israeli Minister of Foreign Affairs; Nahum Bernstein, Secretary of Israel Speaks. All of these individuals are known to have been active in the Israeli Intelligence Service. It is pointed out that much of the information concerning Feinberg pertains to his dealings with individuals in the democratic administration from the President down to lesser officials. This is not being repeated in the blind memorandum because it is believed that the repetition of such information by the Bureau may lead to embarrassment. It is further pointed out that information in the blind memorandum pertaining to the fact that Ben-Arzi, Shiloah, Kollek and Bernstein are identified with Israeli Intelligence activities has been disseminated to only high level officials of the government under secret and top secret security classifications. In the cases of Nahum Bernstein and Ruben Shiloah [founder of Mossad] the information has not yet been disseminated to the Department of Justice. Information concerning [redacted} has not been included in the blind memorandum because it is received under the agreement that it cannot be disseminated. Background (PDF 273 KB) Selective Service records at Albany, New York reflect that Feinberg registered for Selective Service October 16, 1940, at New York City...As will be set out hereinafter in this memorandum, Feinberg, through the years, has been in close contact with officials of the Israeli Government and has been in contact with officials of the United States Government, including the President of the United States and his administrative assistant, David K. Niles....Schantz had obtained a selective service deferment for Abe Feinberg of New York City. Collins accused Schantz of securing the deferment illegally and stated Schantz had advised Feinberg's local board that Feinberg was employed by the Grove Company in a necessary capacity when actually Feinberg had no connection whatsoever with the Company...Schantz had requested Feinberg's occupational deferment on the basis that he was a production expert. Collins stated he doubted there was any actual connections between the Grove Company and Feinberg and added it was entirely probable that the Grove Co. carried Feinberg on its payroll in order to make Feinberg's occupational deferment appear to be legitimate....Feinberg inquired if he would be continued in c1asstftcation 2A after he left the Grove Company and returned to his own firm, Jack Feinberg and Sons, Inc. This case was discussed with Assistant US Attorney K. Bertram Friedman of the Southern District of New York who advised that inasmuch as Feinberg was 36 years of age and had three dependents and also since he might have been deferred even though the 42A form had not been submitted by Schantz, he would decline prosecution in Feinberg's case. Crum also pointed out that there were a lot of people involved in this affair [the Haganah/Sonneborn arms theft and smuggling network] and the Department of Justice knew it. He further pointed out that there were 70 people involved on the West Coast. Crum went on to state that it was necessary to have a group working rather than Feinberg and that it would be necessary to have a war chest. This group should include Feinberg who would act as chairman and be responsible for the disbursement of funds. He stated that this thing should be handled on a basis and that the program is "de jure" recognition (of Israel) and lifting the arms embargo. Crum related that if this was accomplished, the three cases [Schwimmer, Schindler, Winters] and the 70 potential indictments in Los Angeles would be rendered moot. Wahl advised Crum that he would start immediately by calling Feinberg and a few other people together and "laying the thing on the line." ...In connection with the above, it is noted that the information furnished [redacted] reflects an exerted effort by Feinberg, Wahl and others to use political pressure on the Department of Justice through prominent public officials in order to have oases involving the indictment or possible indictment of individuals involved in violations of the Neutrality Act quashed or favorably handled. In that connection a case had been pending in Miami involving Adolph William Schwimmer, Irving Schindler, et al, in November, 1948, for conspiracy to violate the Neutrality Act in connection with the transporting of planes to Israel when Israel was at war with the Arab States. Information received from an anonymous source reflects the direct interest of the Israeli Government in this matter. On April 1, 1949 Eliahu Elath, Israeli Ambassador to the United States, was advised by his government that it was agreed that the matter relating to Schwimmer and other people under indictment should be taken to the 'highest level" in order to 'squash it once and forever." In this connection, one of several courses of action suggested to Elath by the Israeli Government was for Elath to have Abe (believed to be Abraham Feinberg of New York City) take it up with his friends. ...a proposal had been made to change the venue with regard to Schindler and Levin from Miami to New York and Los Angeles, respectively. ...politics on an extremely high level was entering into the case which was of grave concern...everything possible to expedite prosecution of these individuals and regretted that it was necessary to accede to the proposal made by this Jewish group. ...it was announced yesterday by Henry Morgenthau, Jr., general chairman of the nation-wide drive. the campaign on behalf of reconstruction and resettlement needs in Israel and elsewhere has a goal of $272,455,800 for the coming year. Mr. Feinberg, who is president of Jack Feinberg and Son, will have the responsibility for stimulating intensive fundraising activities among business men in all spheres 0f economic life throughout the country." Under his guidance, Mr. Morgenthau added, chairmen will be appointed for individual trades and industries, and industry committees "are to cooperate in mobilizing campaign volunteers and contributors." On March 28, 1951, Morton Rosenbleuth, representative of the Israeli Minister of the Israeli Ministry of Finance for the western Hemisphere, advised Kollek that he had informed David Wahl that he was prepared to finance $25,000 if he would obtain a document from Montor "setting forth the whole idea. On March 28, 1951, Ko11ek was again in touch with Feinberg re1ative to financing Israe1 Speaks." The "New York Times" dated 4-24-49 reported a dinner held at Waldorf Astoria Hotel in New York on 4-23-49 for Dr. Chaim Weizman, first President Of Israel. Among speakers was listed Abraham Feinberg, Ohairman of the New York Committee Of the Weizman Institute Of Science. Theodore Kollek, Israeli Minister, advised David Wahl of a conversation he (Kollek) had With Henry Montor concerning saving the publication "Israel Speaks." After Kolleck informed Montor of the personal interest which Ben-Gurion; Israeli Prime Minister, had in the publication, Montor gave assurances that he would attempt to find a solution. The informant further reported that on the same date, Kollek contacted Abe Feinberg, President of "Israel Speaks," and informed him of the aforementioned discussion with Montor, as well as the discussion with Wahl. Feinberg informed Kolleck that "they" had been frustrated for 3.5 months waiting for Montor to make a decision and that the time had come for the decision to be made. 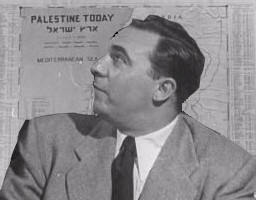 Theodore Kollek, Israeli Minister, advised David Wahl of a conversation he (Kollek) had with Henry Montor concerning saving the publication "Israel Speaks." After Kolleck informed Montor of the personal interest which Ben-Gurion; Israeli Prime Minister, had in the publication, Montor gave assurances that he would attempt to find a solution. The informant further reported that on the same date, Kollek contacted Abe Feinberg, President of "Israel Speaks," and informed him of the aforementioned discussion with Montor, as well as the discussion with Wahl. Feinberg informed Kollek that "they" had been frustrated for 3.5 months waiting for Montor to make a decision and that the time had come for the decision to be made. On 3/5/49 Wahl and Feinberg had a conference in which they discussed the necessity of securing some intelligent person to do a public relations job in Washington D.C.; someone besides Hy (last name unknown) [possibly "Si" as in Isaiah Kenen, later the founder of the American Israel Public Affairs Committee]. They referred to getting 400 odd Congressmen lined up and obtain clearance for erecting a memorial of some kind. They eventually agreed that Herman Ede1sberg would be a good man as he works for B'nai B'rith. Feinberg was quite upset about the Arms Embargo and they did not know whether the Government wanted it. (This refers to the indecision on the part if Israeli officials as to whether or not they wanted the Arms Embargo lifted by the U. S.) They agreed that they couldn't understand why the Israeli Government did not want the Embargo lifted. According to the source, on 2-7-50, David Wahl was in touch with Louis Weintraub and again they discussed the same proposition on that had been discussed on the same date between Wahl and Feinberg, that is, the-deal involving the setting up of a corporation to send material to Israel. On this occasion, Weintraub told Wahl that he had just left Feinberg, and that Feinberg wanted to have a meeting with Leon Moehill (ph); Weintraub stated that this would mean that they would have to get in touch with Leon and get him into New York on the following night. Weintraub indicated that Feinberg and his partner were preparing to go for fifty each, and with Leon Moehill's (ph) fifty, this would mean one hundred and fifty. Weintraub stated that he doubted if there would be any trouble about Israeli pounds. Wahl stated that Josh (Lardner) had three or four other people who were willing to go in on the deal...Weintraub also wanted to ship luxury items as well as necessities in order to compete with other outfits such as Service for Palestine. Wahl stated that he thought that one of the investors should go to Israel, and apparently Leon (Moehill) was the one to go. Wahl advised that Feinberg was going away on Tuesday afternoon and that he would be away for several weeks. 4-3-51 Abe Feinberg contacted David R. Wahl and advised him that he (Feinberg) Wahl, and Harry Zinder, Press Information Officer at the Israeli Oonsu1ate, NYC were to see Rudolph Sonnenborn [of the Sonneborn Institute arms smuggling network] the next day. ..on 12-5-51 David Wahl was in contact with Abe Feinberg. On that occasion Wahl asked Feinberg if he recalled the recording that he, Wahl, had made at the Democratic Party Dinner recently held in NYC. Wahl asked Feinberg what title he should put on the recording, Feinberg told him to entitle it "National Democratic Party Dinner - Abraham Feinberg, Chairman." ..Johnson had asked "Do you remember when in this campaign, we couldn't raise a cent? Do you remember who was first to say 'I pledge $100,000 to re-elect Harry Truman?' It was Abe Feinberg." "I remember Abe," said Truman. "He certainly did come through." "Do you know what would make Abe Feinberg happiest? An Ambassadorship? A job? No. Abe would want you to speak for Chaim Weizmann. You'd be honoring two great men." "All right, Louie" said the President, "I'll do it." ...On April 80, 1951, an Israel official in Tel Aviv sent a cable to Washington which was deciphered by the FBI Laboratory. This cable sent to Theodor Kollek, Israeli, Minister in Washington, stated, "Abe requests Dave Niles stay in Washington Thursday and Friday." (Obviously meaning May 8 and May 4, 1951.) Abe is believed identical with Abraham Feinberg. It is noted that David Ben-Gurion, prime Minister of Israel, arrived in Washington on 5-3-51 and had luncheon With Truman the following day. It is felt that Niles' presence in Washington on May 3 and 4 was desired by the Israelis so that he might assist in arranging for the luncheon between Truman and Ben-Gurion. ...On October 29, 1948, Wahl was in touch with Abe (believed to be Feinberg the president of Americans for Haganah, Inc.) and they discussed a statement issued by one Adler (ph). Abe stated that he saw this statement of Adler's the day previous, and that it was taken over to the Democratic Committee so that they could see it before it went to press. Abe suggested that they make Bart (possibly Bartley Crum) governor. Abe also made the statement that the "C" has another $200,000 coming in. Wahl stated the "C" was still wrapped up in the paper. They then decided to talk the matter over about making Bart Governor with one Max (possibly Max Lowenthal)." ...Confidentia1 Informant [redacted] advised that on January 19, 1949, Abe Feinberg contacted Eliahu Epstein (Chief of the Israeli Mission). The latter advised Feinberg that the *loan was granted and thanked him for his part in its success. Feinberg said it had been a privilege. Feinberg then asked if Dave Niles and Epstein were working out the protocol matters and Epstein said that Weisga1 and the others had met with him yesterday on this. Feinberg also informed Epstein that (C1ark) Clifford, the presidential advisor, had intimated that there would be good news from Britain soon. ...advised that on December 19, 1950 Theodore Kollek, Israeli Minister and Abraham Feinberg discussed a conference Feinberg had with an unknown individual who appeared to be a United Stated Government official. Feinberg described the unknown man with Whom he conferred as "like a little boy with a new toy who liked it very much." Feinberg stated that he "put in a plug" as to the capacity of Israel to make this kind of thing as this would not only provide foreign exchange for Israel but would also save Israel a lot of money. Feinberg informed the unknown individual that General Marshall knew about this "gun" [probably the Uzi submachine gun] from the Israel Foreign Minister and expressed an interest in seeing it. Feinberg expressed sorrow that there was no publicity on "it" inasmuch as "it" would strengthen "our" (Israel's) hand if the public would know that this could be done by Israel." Feinberg said that he had suggested a second name, Owen Lattimore, a Near East expert and head of the Near East Division of John Hopkins, about whom there would be no argument on "our part" and who would be a good choice only because he was not known. Epstein asked if Lattimore were reliable and loyal and Feinberg said he was reliable and close. 1960 Archive AIPAC's executive director publishes an article in the Near East Report titled "No Bombs Possible." It denies Israel can ever enter the nuclear club while monitoring US press coverage of the Israeli nuclear program. "The nuclear reactor story inspired comment from many sources; editorial writers, columnists, science writers and cartoonists. Most of the press seemed finally to accept the thesis that the reactor was being built for peaceful purposes and not for bombs." 03/23/1961 95 KB Two months after taking office, Attorney General Robert F. Kennedy orders a "name" (background) check on Abraham Feinberg. 03/30/1961 1 MB FBI forwards Feinberg "name check" to RFK. 05/10/1978 460 KB Robert J. Lipshutz, counsel to President Jimmy Carter, requests Abraham Feinberg's FBI file. Lipshutz and Stuwart E. Eizenstat (Carter's top domestic policy advisor) later write a memorandum calling for a presidential commission on the Holocaust. Lipshutz writes the presidential order creating a commission led by Elie Wiesel that opens the Holocaust Memorial Museum in 1993.